Detects 2 bands representing Ctip2 at about 120kD. Ctip2 is highly expressed in brain and in malignant T-cell lines derived from patients with adult T-cell leukemia/lymphoma. Fusion protein corresponding to Human Ctip2. Between amino acids 1-150 of CTIP2. Hybridoma produced by fusion of a rat lymphocyte and mouse myeloma. Our Abpromise guarantee covers the use of ab18465 in the following tested applications. WB Use at an assay dependent concentration. Detects a band of approximately 120 kDa (predicted molecular weight: 95 kDa). 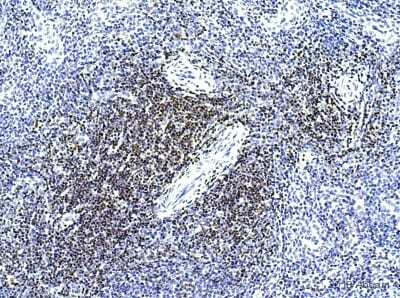 Tumor-suppressor protein involved in T-cell lymphomas. May function on the P53-signaling pathway. May be a key regulator of both differentiation and survival during thymocyte development. Repress transcription through direct, TFCOUP2-independent binding to a GC-rich response element. Highly expressed in brain and in malignant T-cell lines derived from patients with adult T-cell leukemia/lymphoma. Contains 6 C2H2-type zinc fingers. 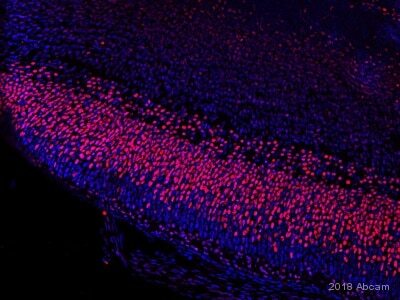 Note the age-related differences in EDU (red) staining: at E12 EDU is found primarily deep in the cortex (bottom of panel), while at E16 it is found in superficial layers (top). In the E12 tissue (A) substantial numbers of cells expressing the deep marker CTIP2 (blue) co-labelled with EDU (pink) while only a few of the cells labelled with CUX also have the maker (yellow). E16 injections (B) labeled cells in layer 3 expressing the superficial marker CART as wells as more superficial cells. 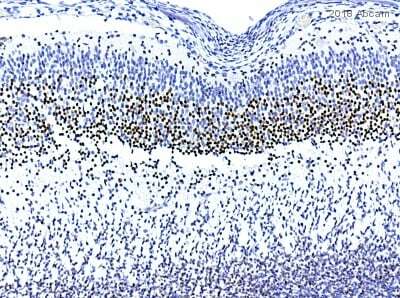 The marker labels all proliferating cells, including glial and perivascular cells. Scale bar = 200μm. Ctip2 is labelled with ab18465. 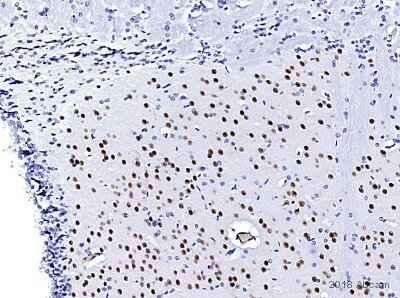 ab18465 staining Ctip2 in Guinea Pig Brain tissue sections by Immunohistochemistry (IHC-P - paraformaldehyde-fixed, paraffin-embedded sections). Tissue was fixed with paraformaldehyde and blocked with 10% BSA for 30 minutes at 22°C; antigen retrieval was by heat mediation in a citrate buffer. Samples were incubated with primary antibody (1/500 in blocking buffer) for 16 hours at 4°C. A Biotin-conjugated Goat anti-rat IgG polyclonal (1/200) was used as the secondary antibody. Neonatal mouse hippocampal neurons stained with ab18465 (top panel - green) and Ctip1 antibody (middle - red). Bottom panel is overlay of ab18465 and Ctip1 antibody staining - yellow indicates co-localisation, green is ab18465 alone and red is Ctip1 antibody alone. 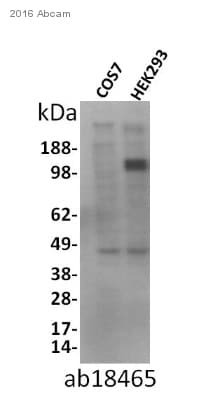 Western blot using ab18465 on nuclear extract from Jurkat cells immunoprecipitated with anti-Sir2 antibody. Two bands are seen which may correspond to two CTIP2 transcripts present in Jurkat cells as previously reported (Bernard et al. 2001). Western blot using ab18465 on nuclear extract from Jurkat cells immunoprecipitated with anti-Sir2 antibody. Two bands are seen which may correspond to two CTIP2 transcripts present in Jurkat cells as previously reported (Bernard et al. 2001). 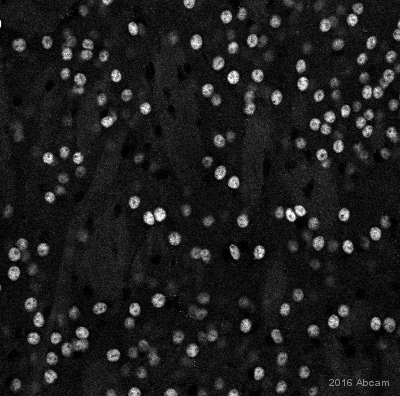 ab18465 staining Ctip2 in mouse brain tissue sections by IHC-Fr (Frozen sections). Tissue samples were fixed with paraformaldehyde and blocked with 10% serum for 1 hour at 22°C. The sample was incubated with primary antibody (1/500) at 4°C for 16 hours. 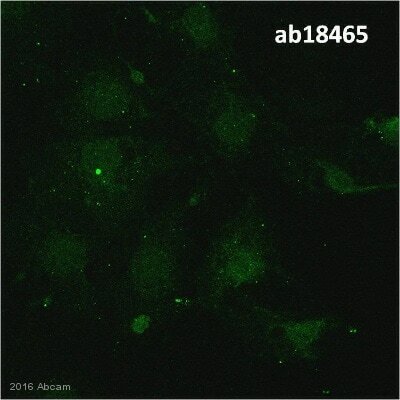 An Alexa Fluor®488-conjugated Goat polyclonal to rat IgG (1/1000) was used as secondary antibody. Staining was improved with citrate antigen retrieval. Neonatal Mouse Hippocampal Neurons (Harvested at P1, grown 5d in culture on glial cell feeder layer). Red is beta tubulin staining. Overlay histogram showing Jurkat cells stained with ab18465 (red line). The cells were fixed with 80% methanol (5 min) and then permeabilized with 0.1% PBS-Tween for 20 min. 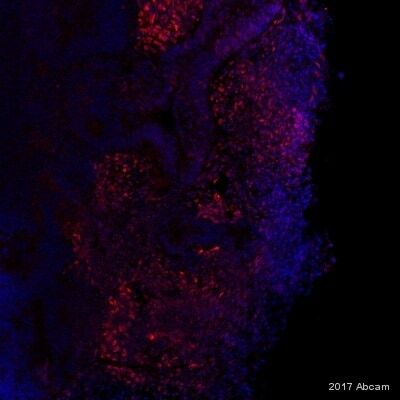 The cells were then incubated in 1x PBS / 10% normal goat serum / 0.3M glycine to block non-specific protein-protein interactions followed by the antibody (ab18465, 1µg/1x106 cells) for 30 min at 22ºC. 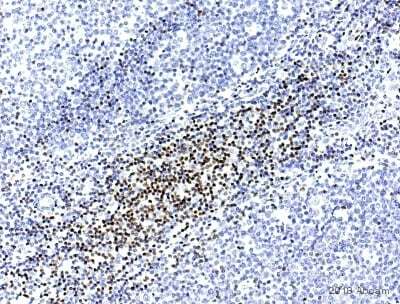 The secondary antibody used was DyLight® 488 goat anti-rat IgG (H+L) at 1/500 dilution for 30 min at 22ºC. Isotype control antibody (black line) was rat IgG (2µg/1x106 cells) used under the same conditions. Acquisition of >5,000 events was performed. 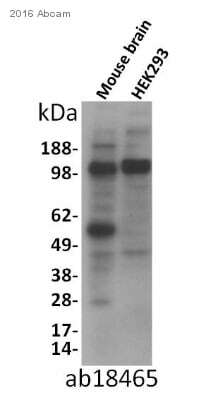 Western blot - Anti-Ctip2 antibody [25B6] - ChIP Grade (ab18465)This image is courtesy of an Anonymous Abreview. Publishing research using ab18465? Please let us know so that we can cite the reference in this datasheet.